Excerpts from the Transcript of the speech Sheryl Sandberg, the current COO, FB gave in her commencement speech to Barnard Class of 2011. The next step is you’re going to have to believe in yourself potentially more than you do today. Studies also show that compared to men, women underestimate their performance. If you ask men and women questions about completely objective criteria such as GPAs or sales goals, men get it wrong slightly high; women get it wrong slightly low. More importantly, if you ask men why they succeeded, men attribute that success to themselves; and women, they attribute it to other factors like working harder, help from others. Ask a woman why she did well on something, and she’ll say, “I got lucky. All of these great people helped me. I worked really hard.” Ask a man and he’ll say or think, “What a dumb question. I’m awesome.” So women need to take a page from men and own their own success. That’s much easier to say than to do. I know this from my own experience. All along the way, I’ve had all of those moments, not just some of the time; I would say most of the time, where I haven’t felt that I owned my success. I got into college and thought about how much my parents helped me on my essays. I went to the Treasury Department because I was lucky to take the right professor’s class who took me to Treasury. Google, I boarded a rocket ship that took me up with everyone else. Even to this day, I have those moments. I have those moments all the time, probably far more than you can imagine I would. I know I need to make the adjustments. I know I need to believe in myself and raise my hand, because I’m sitting next to some guy and he thinks he’s awesome. So, to all of you, if you remember nothing else today, remember this: You are awesome. I’m not suggesting you be boastful. No one likes that in men or women. But I am suggesting that believing in yourself is the first necessary step to coming even close to achieving your potential. Now that is what I would call a refreshing speech, just like any other of her expertise! So instead of updating my blog, I found myself laughing while reading the most perfect & apt book one can finish while sitting in an office cubicle! (that is of course when tons of the work finally gets over, in case you are from my office & reading this ;)) Interestingly, for a change, I came to know about the author here first before the book itself, thanks to 'cricinfo.com' & 'twitter' where I have been following Sidin Vadukut's tweets until he mentioned about his coming book, 2nd of the 'Dork' -trilogy called "God Save the Dork". With no idea of what that title meant, without any reviews or reading his 1st book, I pre-ordered it & as you see, I don't regret it! 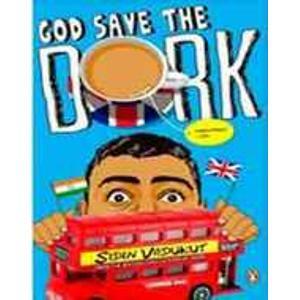 The story continues to narrate the life of Robin 'Einstein' Varghese, through his humorous diary entries as he works as a management consultant & strategy guru at Dufresne Partners, dealing with his 'efficient' co-workers, building 'smart' strategies for his partners, cultural changes at London, his long-distant girlfriend in India Gouri (not to forget her long mails), his tummy upsets & handling public embarrassments, saving from the hotel bills etc! What I liked the most about Varghese's character is the way it connects to any of us, the way he reacts to the everyday situations, how we all have our bad days of which we have no control of, the little narcissists which we all have in different quantities in us, & the way he enjoys it all. My Take: Do grab it, if you have a boring journey to take or if you want to take a break from serious stuffs! A lot happens again. I get a new laptop. I inch closer towards at least one 'Indian Institute' (Indian Institute of Foreign Trade here!) & well, a whole new though not much eventful yet important 'learning' year comes to an. Meanwhile, I did write an analysis @IdeasMakeMarket, about Booming Businesses for 2012 check out my article here.